Image: John Shearer/Getty Images for MTV. 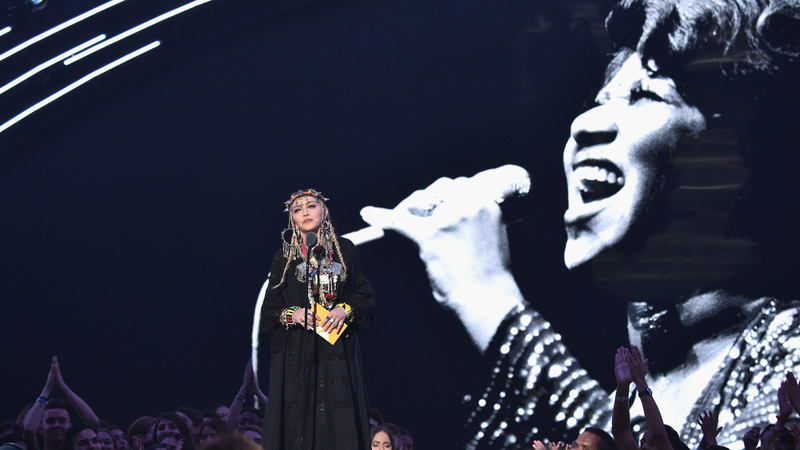 "Aretha Louise Franklin changed the course of my life" is just one of the many things that were said by none other than Madonna during what should have been a meaningful tribute to the late legendary soul singer at the 2018 MTV VMAs. Franklin's death occurred mere days before the VMAs took place on Monday night, so it was only right that the award show would find a way to honor the singer's memory. However, not only did the choice of Madonna leave some folks confused, but the content of Madonna's tribute left many upset because it so blatantly didn't focus on Franklin. It was hard to ignore just how confounding Madonna's speech (not to mention her attire) was on Monday night. With a photo of a younger Franklin projected on a screen behind her, Madonna stood at a microphone center stage delivering a rambling speech that touched on her own rise to fame, how she was perceived by the public and her life and career as it stands today. Franklin, unfortunately, only factored peripherally into this speech. It's clear to see from her opening lines that Madonna was, for some reason, focused on talking about Madonna. "Aretha Louise Franklin changed the course of my life. I left Detroit when I was 18," the singer recalled. "Thirty-five dollars in my pocket. My dream was to make it as a professional dancer. After years of struggling and being broke, I decided to go to auditions for musical theater. I heard the pay was better. I had no training or dreams ever, ever becoming a singer, but I went for it. I got cut and rejected from every audition. Not tall enough. Not blend-in enough. Not 12-octave-range enough. Not pretty enough. Not enough enough. And then one day, a French disco sensation was looking for backup singers and dancers for his world tour. I thought, 'Why not? I could go back to getting robbed, held at gunpoint and being mistaken for a prostitute in my third-floor walk-up that was also a crack house. That's right. I'm a rebel heart." The majority of Madonna's speech, which you can read on E! News, continued to ramble on as she recalled her own struggle to make it as a singer. But somehow, Madonna actually managed to bring it back full circle to Franklin, loosely connecting the majority of the tribute, which had been focused on her, back to Franklin. "You are probably all wondering why I am telling you this story," Madonna began as she made her way toward the conclusion. "There is a connection because none of this would have happened — could have happened — without our Lady of Soul. She led me to where I am today. And I know she influenced so many people in this house tonight. In this room tonight. And I want to thank you, Aretha, for empowering all of us. R-E-S-P-E-C-T."
Wow. So, clearly sensing something was totally amiss, folks hopped onto Twitter to call out Madonna for her tone-deaf tribute, with some recalling her similarly failed tribute to Prince at the 2016 Billboard Music Awards and others noting she blatantly made the moment about herself rather than really dedicating time to Franklin's life. MTV has yet to address the public backlash against the tribute to Franklin, but Madonna issued what may be her only comment on the matter. In a post to her Instagram, the singer published a statement clarifying her intentions for the speech. "And just to clarify: I was asked to present Video of the Year by MTV!" she wrote. "And then they asked me to share any anecdotes I had in my career connected to Aretha Franklin! I shared a part of my journey and thanked Aretha for inspiring me along the way. I did not intend to do a tribute to her! That would be impossible in 2 minutes with all the noise and tinsel of an award show. I could never do her justice in this context or environment. Unfortunately, most people have short attention spans, and are so quick to judge. I love Aretha! R.E.S.P.E.C.T."